Location: On the road from Meavy to Cadover. Just after crossing Marchant’s Bridge over the River Meavy, the cross is up the hill on the left hand side, at the junction with the narrow lane that leads to Yeo Farm. Purpose: Waymarker on the South Western route of the Abbot’s Way, between the Abbeys of Buckfast and Buckland. It also marks the way of the track from the Augustinian Priory at Plympton to Tavistock Abbey, via the Priory’s manors of Meavy and Sampford Spiney. Size: 7 feet 10 inches (2.40 metres) tall. 2 feet 3 inches (0.70 metres) across the arms. Information: This ancient and distinctive looking cross is quite tall and comparatively short across the arms. It is still in quite good condition, the only visible damage being a small piece that has been broken off the under side of one of the arms. There is an incised cross on each face of equal size, measuring 2 feet 3 inches high and 1 foot 2 inches across the arms. It is thought that the name of ‘Marchants’ is possibly a corruption of the word ‘Merchant’. This being the case, the cross could have been the gift of a trader, perhaps even a wool merchant who would have regularly used this route to Buckland Abbey. There was also a theory that this cross was the ‘Smalacumbacrosse’, one of six crosses used to mark the boundary of the lands donated to Buckland Abbey by Amicia, Countess of Baldwin de Redvers, Earl of Devon. (Further details of this can be found on the page for the Yennadon Cross). However, Richard Hansford Worth, in the paper entitled ‘Transactions of the Devonshire Association’ for 1942, refuted this suggestion. His research led him to the conclusion that the boundary laid down in the deeds would have been at the head of the Smallacombe Lake, almost a mile to the East. Legend has it that the cross also marks the grave of a suicide. Whilst there is no evidence to support this, it is feasible in that suicides used to be buried away from the centre of the village and often at a crossroads, in order that their spirits become confused as to the direction they should take. 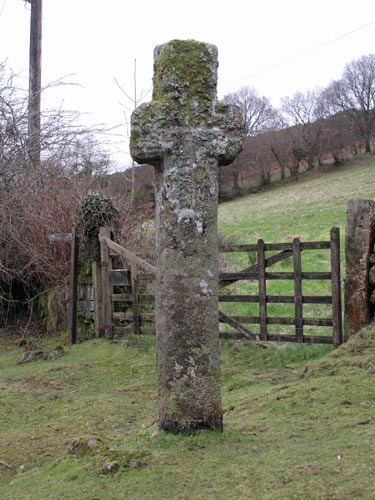 William Crossing recorded the tradition that suggested the cross was in use as a boundary stone, before being brought into service as a waymarker. He also wrote that travellers used to kneel before the cross to pray for a safe journey, before setting out across the moor. 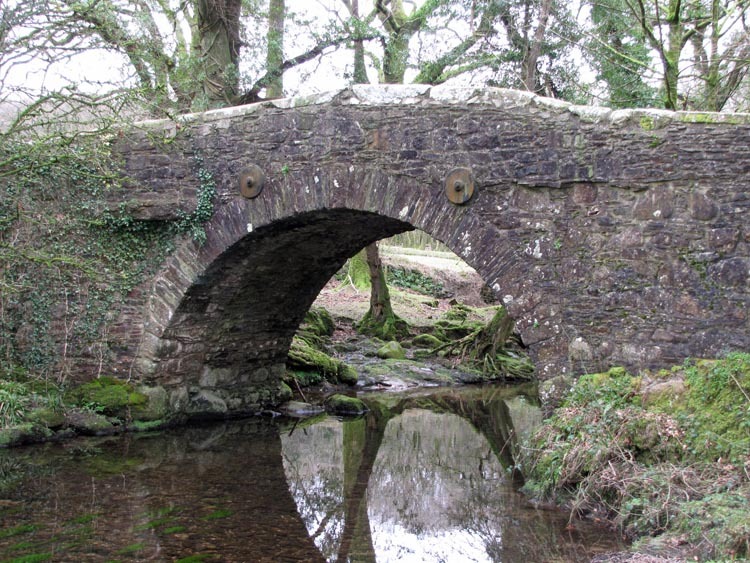 Just down the road from the cross is Marchant’s Bridge, over the River Meavy. The road from Meavy, to Cadover Bridge, comes down the hill and used to proceed in a straight line across the ford in the river. However, it has now been diverted to cross the river by the bridge, a few yards upstream. 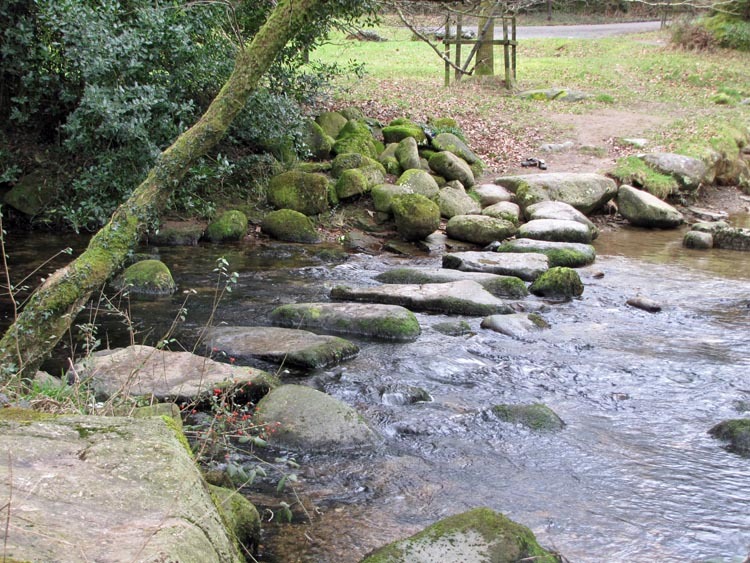 Between the bridge and the ford are a series of large stepping stones, which used to help the wayfarer to keep his feet dry. When I first visited Marchant’s Cross, it was about 4pm on a sunny afternoon in mid-October. I had walked to the cross from Meavy and, as I passed the school, I could hear the children giving a music and dance performance, in the grounds behind the school. The sound of children enjoying themselves carried with me all the way down the road, over the bridge and up to Marchant’s Cross. The magic of this spot, with its picturesque beauty and carefree sounds, had me in a spell and it was with great reluctance that I turned my back and continued on my way.